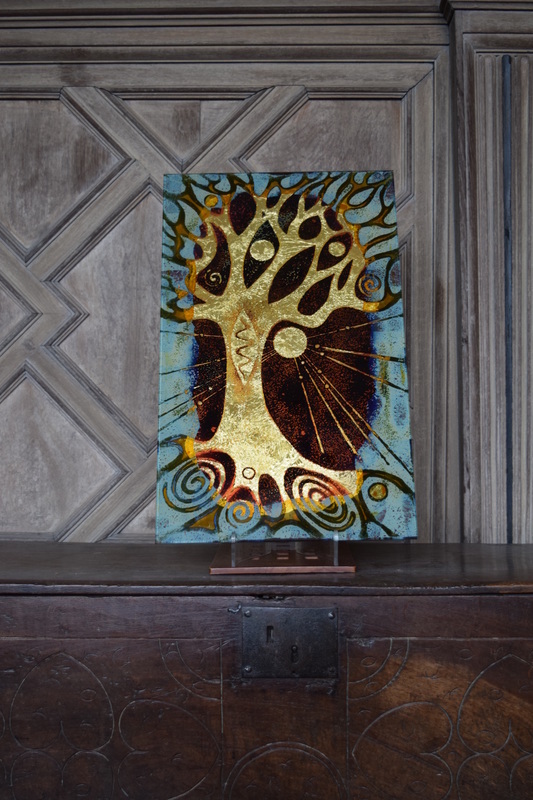 Making a fabulous focal point for your home, resonating with the ideas "Tree of Life" and "Family Tree"
Two sided : fiery golds on one side, deep rich shades upon the reverse, reflecting how in nature the tree changes with the seasons. 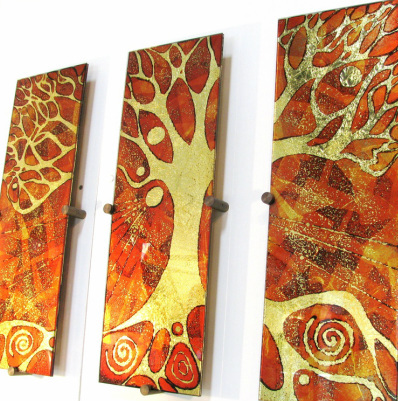 Textures and vibrant colours are held within the smooth surfaces creating an interaction with light that makes this artwork so beautiful : something to see afresh everyday and enjoy forever. 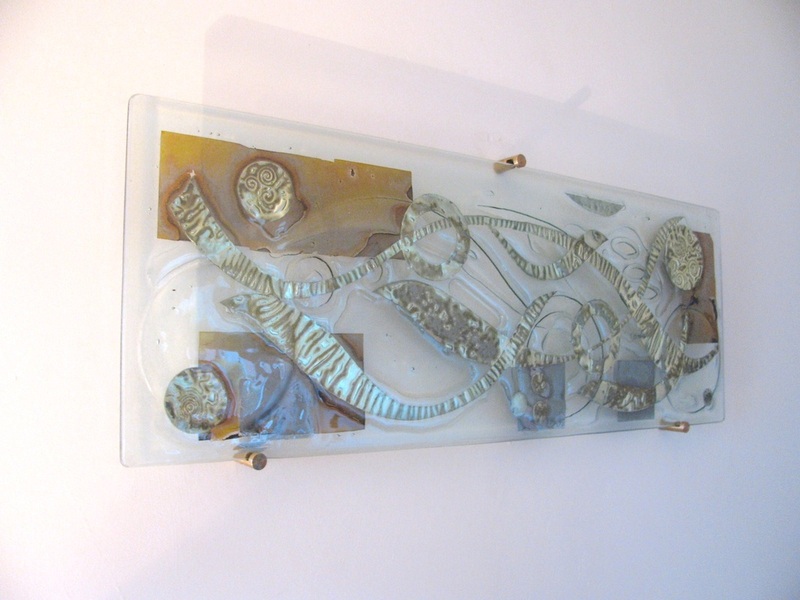 Platinum, Palladium, Silver and Gold fused between glass at almost a thousand degrees Centigrade to create rich reflective interactions of patination. 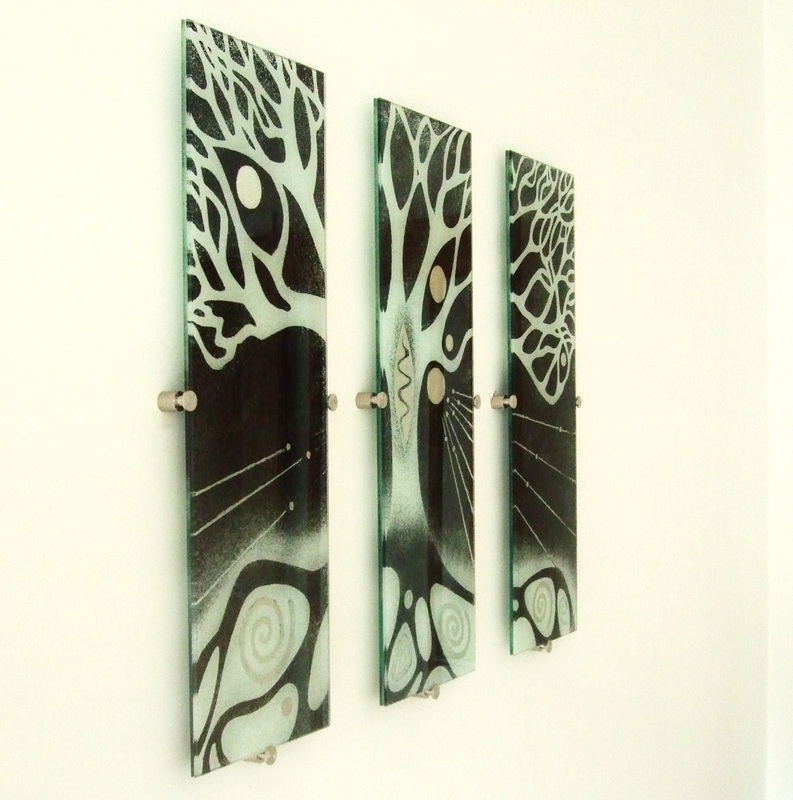 Wonderful mounted on a wall , in a window or free standing . 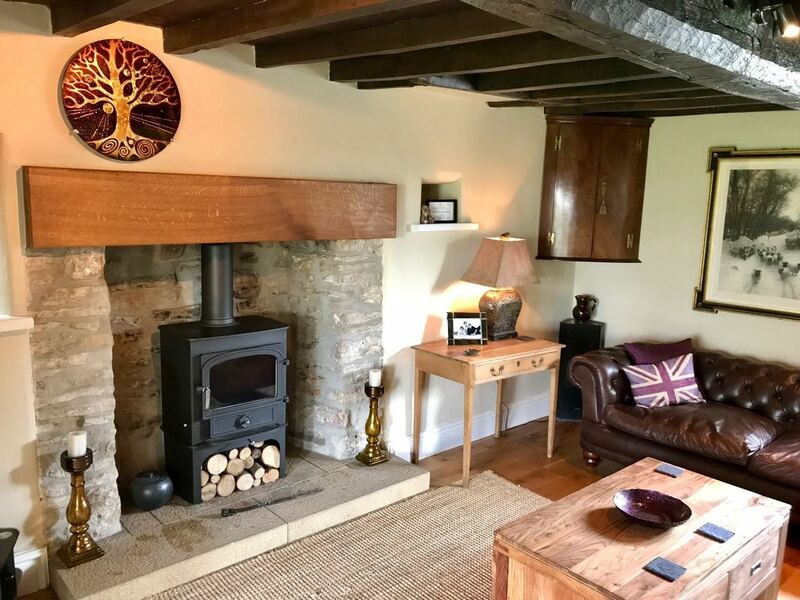 We make windows to commission to create beauty in your home, or perhaps to solve a problem such as privacy or obscuring an uninspiring view. In early Spring the buds begin to unfurl. The Winter structure of the tree is surrounded by a halo of newly emerging fresh green leaves with the promise of the coming Summer. 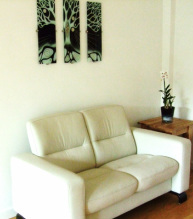 The dynamic rhythms of nature in abstract form. 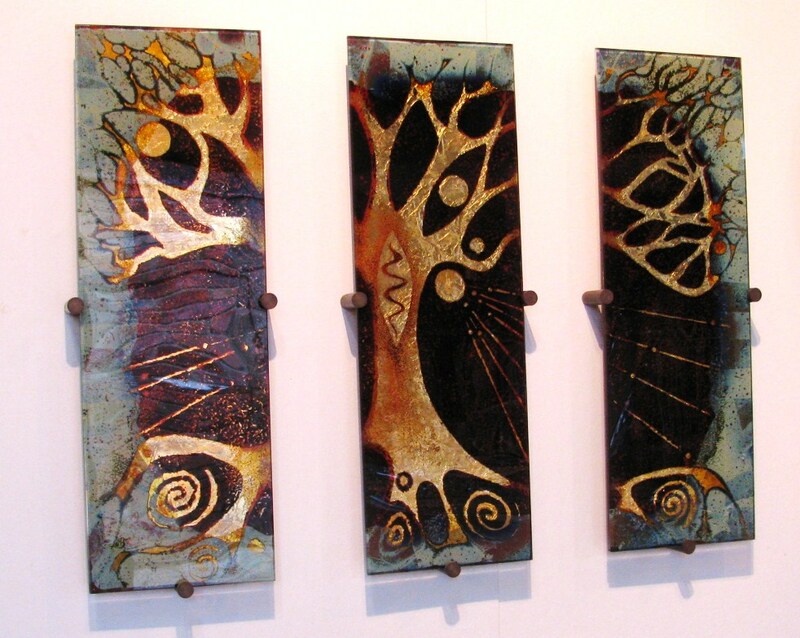 These artwork is two sided - vibrant and fiery one side, deep rich and contrasting upon the other. Sunrise, sunset, look out to the islands and mountains. The layer of 24ct Gold beneath the colours shimmers and sparkles through like sunlight upon the sea. 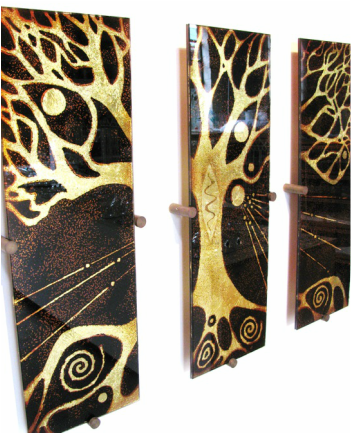 Elegant, graceful and peaceful : flowing rhythms : floating flowers : light flickering on Gold. "Autumn" is a theme that is equally beautiful on both sides, capturing glowing Autumn colours on one side, and contrasting deep colours upon the other. Ancient imagery speaks of eternal tales. Celebrate weddings, anniversaries or just being in love! These pieces can be personalised with imagery that is meaningful to you, or to have dates and initials hidden and woven into the design: a visual puzzle and intrigue. 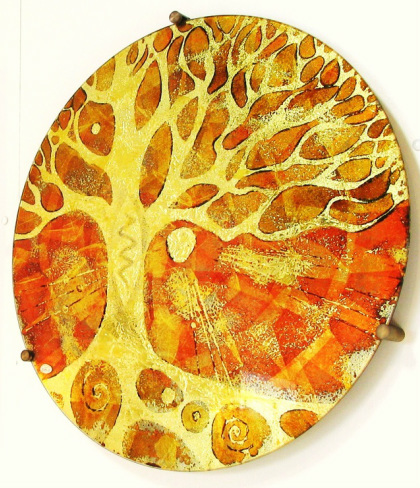 "Elements : Fire and Earth"
Radiating warmth, this piece is equally fabulous on both sides . Fire on one side........ flip over to find Earth. 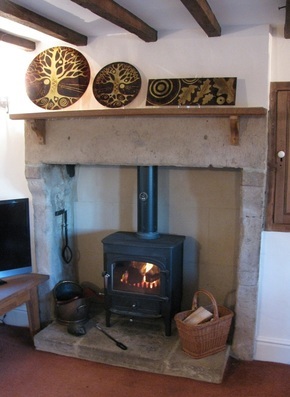 Team it with a wood burning stove to see how it interacts and glows by firelight. 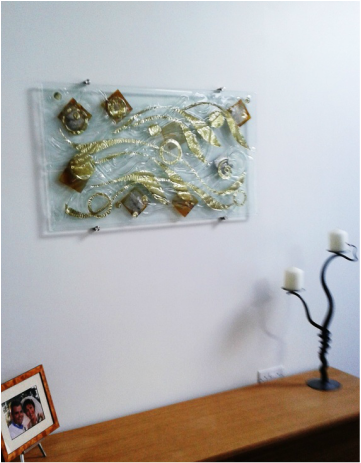 When the fire is out that warm homely feeling lives on in the glowing glass and 24ct Gold combination. 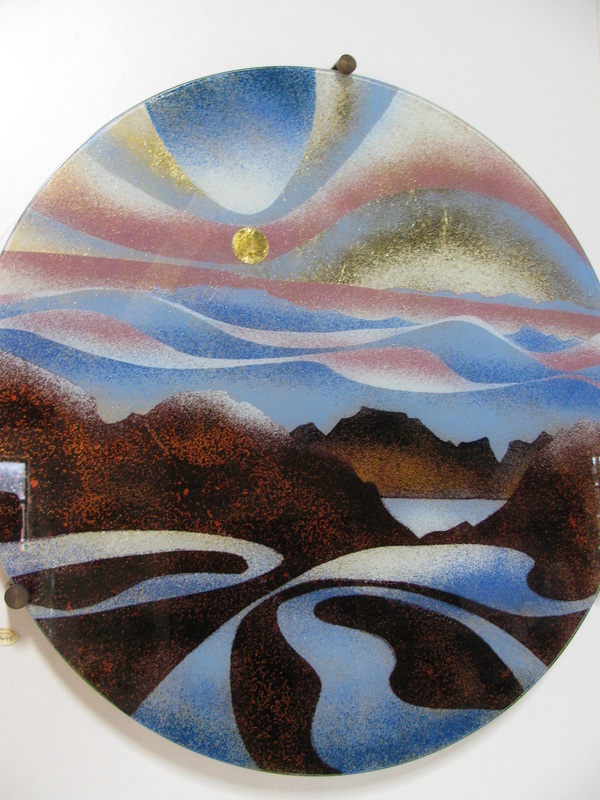 With colours ever changing with your angle of view this glass goes way beyond having a painting on your wall. Always interacting with light, intriguing, delightful, beautiful and ........ fun! You cannot help but stop and explore with your eyes. 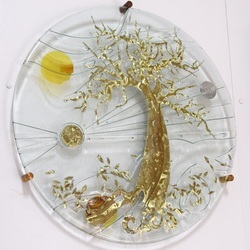 Glass fused with 24ct Gold. 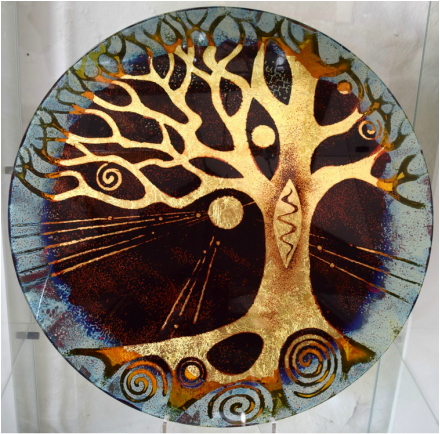 All our art works are individually designed and handmade. We can create something specially for you. Click the button below to take you to the "Commissions" page for lots of inspiration.